Angel is going to become a big sister in no time. Yes, my little girl is going to become a big girl. It makes me feel thrilled and in preparation for the big day, I have been reading Dora's Big Sister book to her, letting her feel the baby's kicks and join in every ultrasound, explaining to her about how a new baby is going to join our family, buying a baby toy for her which she really loves to hug and bathe. Last but not least, we have also been doing some craft sessions at home too. Yes, how can we miss that out? 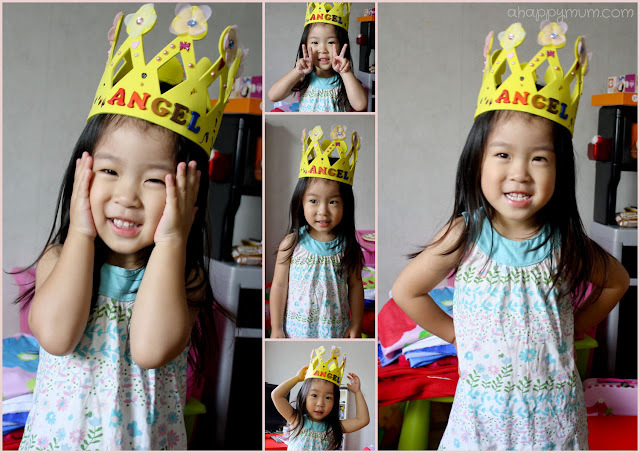 In this week's Creativity 521, I'm sharing with you a very simple DIY craft Angel did almost entirely by herself! It's her very own Big Sister crown! With her apron on, we are all set! Firstly, she painted the letterings one by one. She chose all the colours herself and only needed my assistance when it came to painting the edges. Seriously, I had some differing opinions on what colours match one another but then again, this was her craft and her time to be creative so I just allowed her to do basically whatever she liked. It was also a great way for her to remember how to spell her name! Yes, she can do it now! Next, we pasted the letterings onto the crown and started to decorate the rest of it. It was the first time Angel used glitter glue by herself and boy was she fascinated by it! She would exclaim "Mummy, it's a caterpillar!" and then try her best to squeeze it out. Alas the 'caterpillar' doesn't come out that easily and require a certain amount of strength. So in the end, the glitter ended up looking like dots and short lines on her crown. Again, if I were to do it, I would be able to draw fanciful borders, make swirling designs or write words with the glitter. But I managed to tie my hands up and stopped myself from interfering, instead all I did was become an onlooker and supporter. Lastly, she stuck on some flowers, stickers and pearls to complete the look. We also added in some heart-shaped brads just to fill it up with love. That, I had to help because the pins were sharp and pretty hard to poke through the foam. She would decide where to place the brads and I would help to fasten them. Ta-dah! Presenting to you Angel's first ever crown, in celebration of her becoming a big sister as she turns three. Do you like it? I sure do and no matter what others think, this was a beautiful crown to me because it was made with her hands and from her heart. The most heartwarming thing was seeing my girl running around in her new crown, exclaiming in delight "I'm going to be a big sister!" Yes you are, my love. And you know what? You will be a most awesome one. Hehe yeah, a very very small one maybe! Thanks Ai! So beautiful, Angel is really good with her hands :) I am sure she will be a good big sister. Thanks Virginia, that's such a sweet thing to say! Thanks Martini for linking up! =) Hope to see you joining in the party in future too, it's great to share craft inspiration! Glad you liked what she did too! We read the Dora book to Poppy too when I was pregnant! Oh she's also recently discovered the joys of glitter glue. There's no turning back now! !